I returned from the BITS, Pilani to Baripada in February 2009. I was excited about art after getting the prizes in BITS. You can read about that story here. BITS had given me assignments to do. I had a month to complete my assignments. As soon as I finished my assignments the art fever took over. I painted the “Winter trees”. The story behind it can be found here. I painted the “Sunset” in the same week. It would be good to read the story about winter trees where I describe the variegated wash. 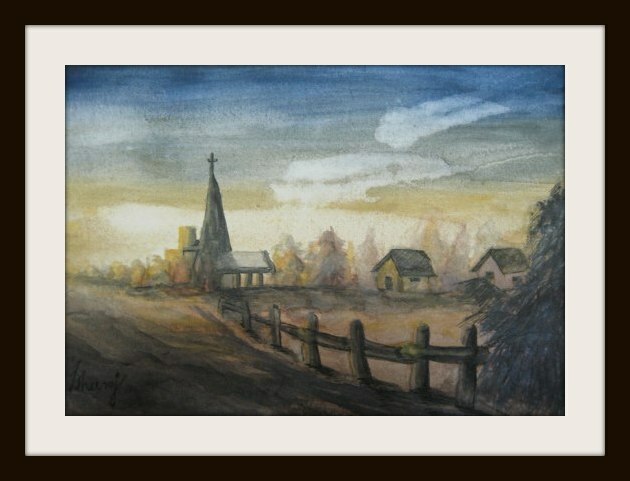 In ‘Sunset’ I began with variegated washes with Prussian blue. I wanted to give the feel of coming night. I wanted to mix a shade of yellow to signify the setting sun. The yellows were allowed to blend with red and brown in the lower part of the paper. Unfortunately the top two colours mixed and gave a shade of green in the sky! I have warned about this in “Winter trees”. However this can be used to ones advantage if one is using blue-purple-red-orange- yellow sky by using variegated washes of blue, red and yellow in a proper manner. I diluted off the green by pouring water and let the whole thing run across the page by hanging the page side-on. By the time the paper is nearly dried I poured extra water and allowed it to take away some pigment and form the formation of clouds. I dabbed a little bit with a old handkerchief. Doing it too much can spoil the paper. Once completely dry, I did the distant trees with light shades of yellow and brown. The building was painted with grey. A part of it was made with transparent wash allowing the sunlit sky to shine through the building. The fence was drawn with linear perspective. The oddities in the structure signify the rickety road to the Church. The dark silhouette of a tree in the foreground ‘pushes’ the rest of the painting behind and brings about the depth required. I was careful to add the shadows of the structures away from the light source. Hope you liked this and have learnt something from it. Happy painting. This entry was posted on April 28, 2013 at 12:29 am	and is filed under art. Tagged: art, landscape, technique. You can follow any responses to this entry through the RSS 2.0 feed. You can leave a response, or trackback from your own site.